FAYETTEVILLE, Ark. – Hester A. Davis, Arkansas’ first State Archeologist, died Tuesday Dec. 30, 2014, in Fayetteville, Arkansas. She was 84 years old. A memorial event will be held in her honor from 1-3 p.m. Saturday, Feb. 21, in Giffels Auditorium. Attendees are encouraged to bring memorabilia to celebrate Davis’ many contributions and interests. Davis joined the University of Arkansas in 1959 as the preparator at the University of Arkansas Museum and later became its assistant director. She taught in the Department of Anthropology for 10 years. In 1967 she was appointed State Archeologist and held the post for 32 years. 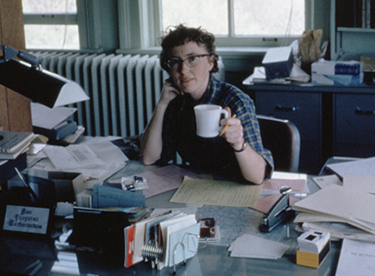 Among her many acts of service to her field, Davis was a founding member of the National Association of State Archaeologists, the American Society of Conservation Archaeology, the Society of Professional Archaeologists and the Arkansas Archeological Society. She was a committee member and officer of many organizations. On the international level, Davis was a member of the U.S. Committee for the International Council on Monuments and Sites. She was appointed by President Bill Clinton to the Cultural Properties Advisory Committee of the United States Information Agency. Upon her retirement in 1999, Davis created the Davis Internship in Public Archeology, an endowment that has helped 10 students achieve advanced degrees in anthropology. Among her many honors are two distinguished service awards from the Register of Professional Archeologists, one of which bears her name. Among her most prized recognitions was the “Best Damn State Archeologist Award” given by the National Association of State Archaeologists in recognition of her retirement. Born June 4, 1930, in Ayer, Massachusetts, she was the youngest of Edward and Dorothy Davis’ five children. She earned a Bachelor of Arts in history from Rollins College, a Master of Arts in social and technical assistance from Haverford College and a Master of Arts in anthropology from the University of North Carolina. She was awarded honorary doctorates from Lyon College and Rollins College. About the Arkansas State Archeologist: The Arkansas State Archeologist is involved in all aspects of public archeology including site reporting, coordination with public agencies and public education. The State Archeologist nominates sites to the National Register of Historic Places, proves information on reporting sites within the state and is an expert on state laws pertaining to the state’s archeological sites.The education component includes materials and programs for teachers, students and the general public. The State Archeologist works closely with the Arkansas Archeological Society to develop and produce an annual Society and Training Program and organize activities for Arkansas Archeology Month and oversees the production of the Arkansas Archeological Survey’s education program, which includes materials such as books, exhibits and informational flyers. The Arkansas Geological Survey studies and protects archeological sites in Arkansas, preserves and manages information and collections from those sites and communicates its finding to the people of Arkansas. It is part of the University of Arkansas System. About the University of Arkansas: The University of Arkansas provides an internationally competitive education for undergraduate and graduate students in a wide spectrum of disciplines; contributes new knowledge, economic development, basic and applied research and creative activity; and provides service to academic and professional disciplines and to society in general, all aimed at fulfilling its public land-grant mission to serve Arkansas and beyond as a partner, resource and catalyst. The Carnegie Foundation classifies the University of Arkansas among only 2 percent of universities in America that have the highest level of research. Founded in 1871, the University of Arkansas comprises 10 colleges and schools and offers more than 200 academic programs. The university maintains a low student-to-faculty ratio of 19:1 that promotes personal attention and mentoring opportunities. U.S. News & World Report ranks the University of Arkansas 63 among the 623 American public research universities, and the university’s goal is be top 50 by the celebration of its 150th anniversary in 2021.